For years, stomachs across Long Beach lamented the city’s lack of a proper ramen house. Be it Hakata or Onomichi ramen, tsukemen ramen or all the other ramen varieties that create the rainbow arch of Japan’s staple dish, there was a culinary hole in the local Asian cuisine scene that has long been dominated by Thai food, sushi and fast Chinese. Sure, a Thai joint here or a random sushi bar there would offer a ramen option—Bamboo Teri House in Bixby Knolls immediately comes to mind—but it was toward the back of the menu, typically hidden in a corner. However, true ramen lovers would have to trek beyond the borders of Long Beach to experience a solid bowl. You could venture to L.A.’s Little Tokyo and wait in line to experience the Hokkaido-based Hakata ramen stylings of Daikokuya, where creamy bowls of tonkotsu pork broth—where pork bones bounce around in boiling liquids for hours and sometimes days on end, their bits of marrow melted into minuscule grains that create a cloudy bowl of broth—cook egg noodles to al dente perfection. Or, if you wanted to travel a bit less, there was an almost-as-good Hakata bowl at Shin Sen Gumi, which has locations throughout the Southland, including a ramen drive-thru. Or go to Gardena for a bowl of shoyu ramen at Asa or Sapporo ramen at Mottainai, two additional styles also based out Japan’s Hokkaido region. 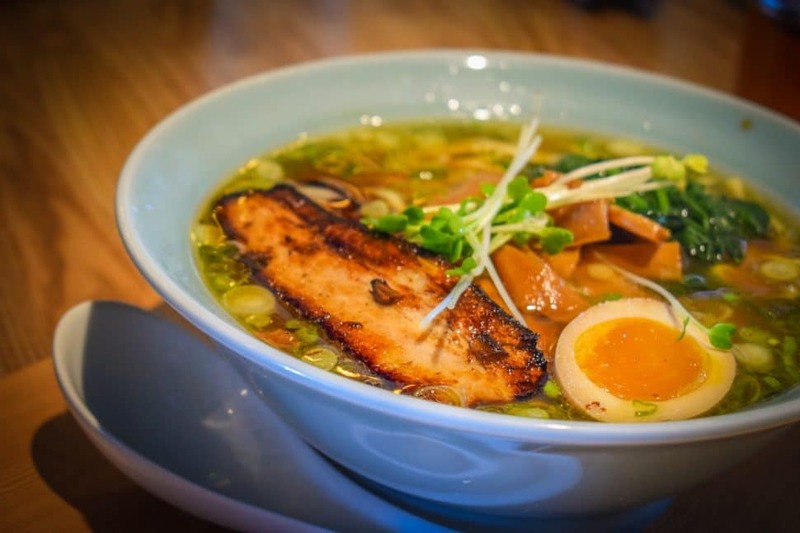 The larger point here is Long Beach lacked restaurants whose main focus was the art of Ramen. It’s an art that has garnered a Michelin star. That star belongs to Chef Onishi Yuki’s Tsuta ramen shop, offering Tokyo-style ramen, long considered the country’s standard definition of ramen with its seafood-meets-chicken broth—and it will soon be opening a location in Glendale. It’s an art that provides comfort to Japanese citizens and immigrants and descendants across the world. 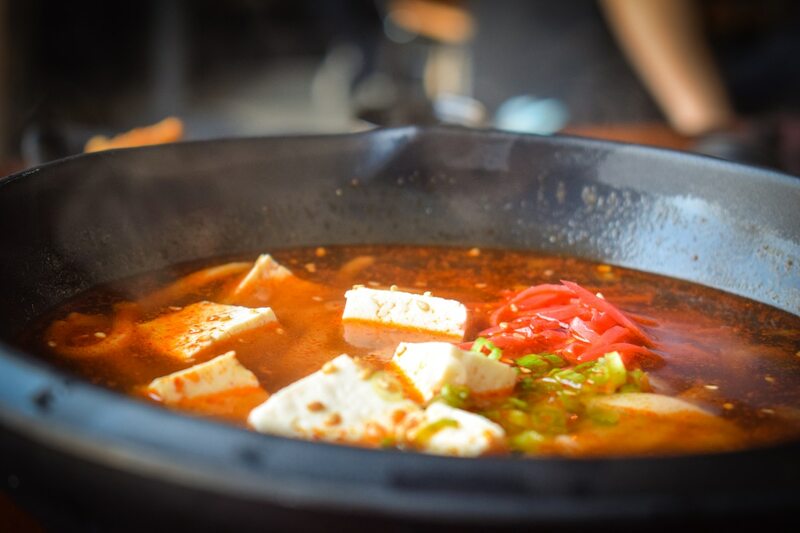 And now, Long Beach has four houses to share this experience with (with a fifth on the way: Mr. Makoto, the new ramen joint from the owners of Seoulmate, will be opening this fall at 2741 E 4th Street where Yummy Garden used to be). Let’s begin with what I consider to be the best and we’ll count down from there. HiroNori Craft Ramen, in Long Beach’s Bixby Knolls neighborhood, and their bowl of Asahikawa-style ramen. Photo by Brian Addison. HiroNori’s vegan ramen and Asahikawa-style ramen—often misnomered shoyu ramen because that is the name of its soy-based broth—is astounding, but it’s the Hakata-style ramen that is the true star of this Irvine-based, tiny-but-mighty ramen shop. Chef Hiromichi Igarashi offers a hefty bowl of creamy tonkotsu Kurobuta pork broth paired with a hefty serving of house-made noodles. I prefer their thicker noodles that giving more of a bite than their thin noodles, which tend to overcook quickly. Then there’s green onion, some spinach, seaweed and the star: Two hefty pieces of chashu, braised pork that is then wonderfully charred and caramelized so that their small edges of fat are consolidated with the creaminess of the broth. Of course, here is where you can amp it up with HiroNori. For one, get an egg added to your ramen; ajitama is a soy broth-soft boiled egg that is nothing short of delicious and is usually included in every bowl of Hakata ramen. 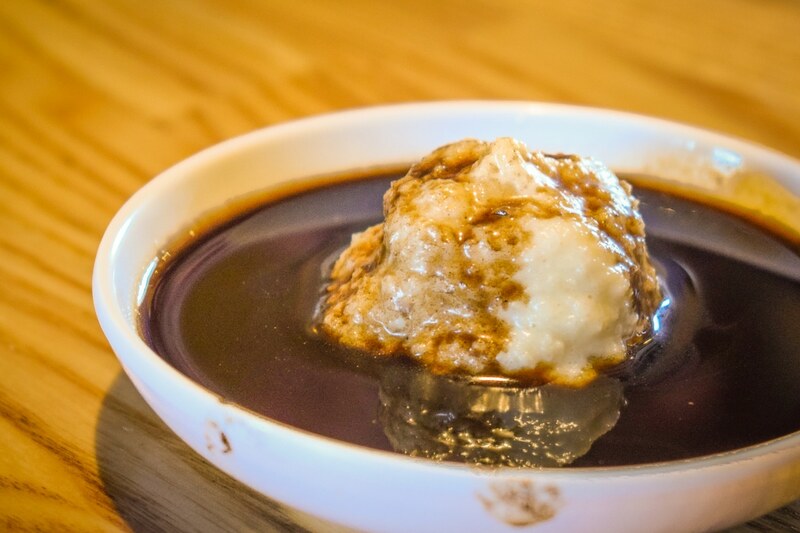 But specific to HiroNori is their gluttonous black garlic sauce, a dreamily dark, lard-based oil that includes a heap of whipped garlic. Pour this fatty liquid carefully into your ramen as it is both hefty on flavor and intensity, leaving endless garlicky remnants throughout the rest of your ramen experience. Adding onto this, their vegan ramen deserves another mention because HiroNori is home to the best vegan ramen in the city. They play off of Sapporo ramen—based out of the Hokkaido region of Japan like its Hakata sibling—using miso to create a creamy base. 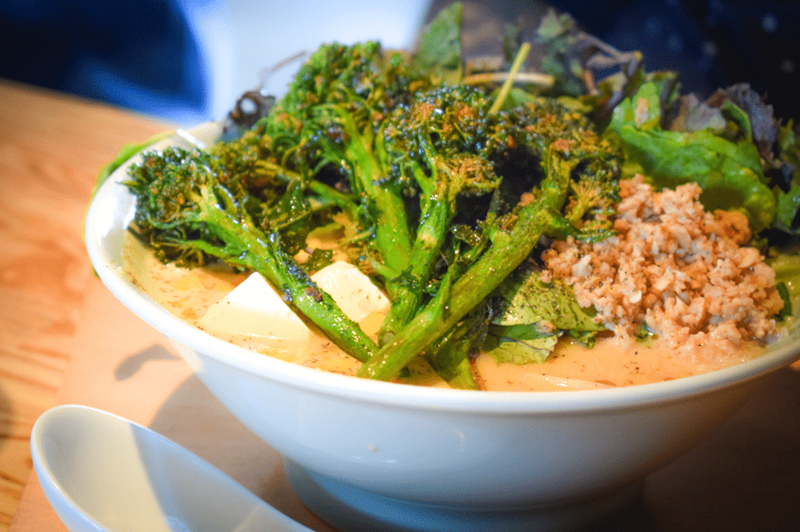 But rather than seafood and butter to add depth and richness, HiroNori layers sesame oil into the miso, mimicking the fatty quality of tonkotsu and adding beautifully charred broccoli, quinoa, tofu and bamboo. They have one sole downfall: No beer. Downtown Long Beach’s Gu Ramen, based out of Laguna Beach, and their bowl of Hakata ramen. Photo by Brian Addison. Laguna Beach’s Gu Ramen took over the much-missed Kabob Curry in DTLB on Third Street between Pacific and Pine, and it is a welcome addition to a growing food scene that was starting to, ever so subtly, wear thin in DTLB. 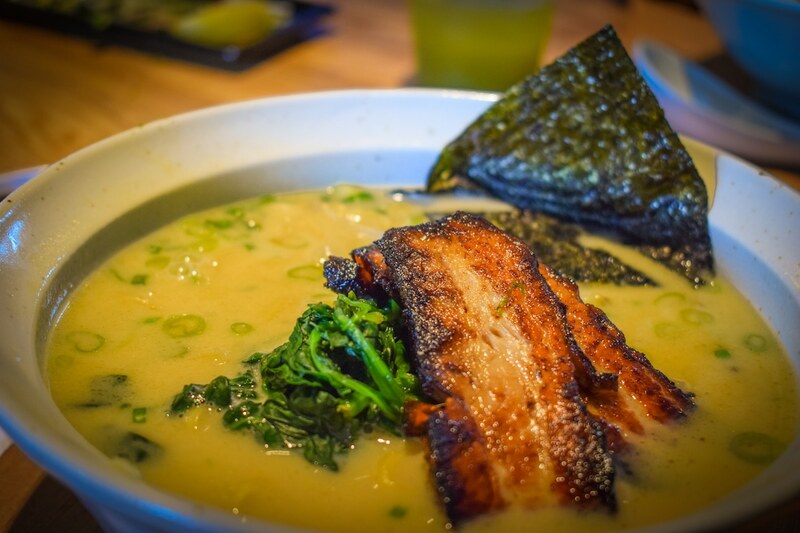 Like every ramen house on this list, Hakata ramen is their strongest focus. 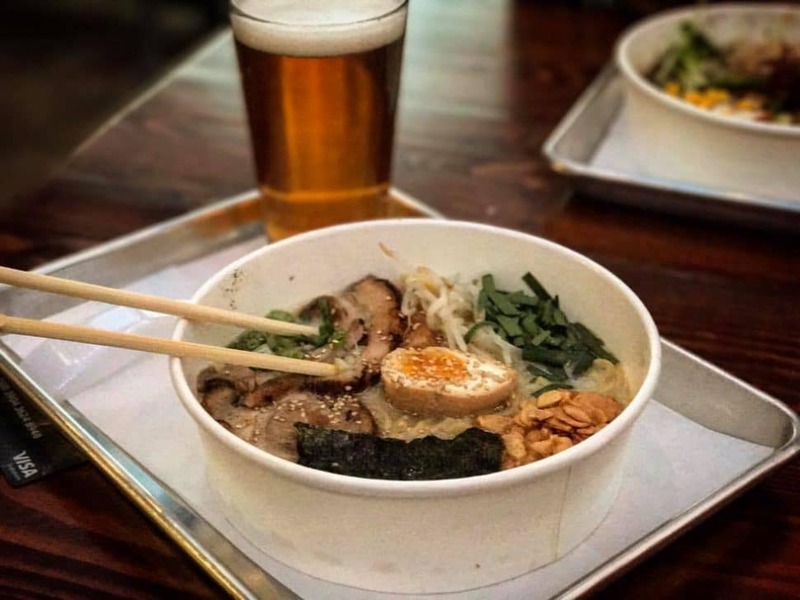 Dubbed Gu Ramen, their house bowl of noodles is filled with tonkotsu broth—though their version eschews a pure Kurobuta pork bone broth and adds chicken bones to the mix. It’s offered with either ramen or udon noodles. The latter noodles, a thick’n’chewy wheat-based noodle, is the house’s sole vegan noodle and can be a fully vegan dish by asking for their shoyu-based broth; their ramen noodles are egg-based. While their chashu is incredibly flavorful, it lacks the charred beauty of HiroNori’s pork (though that’s somewhat made up for with the addition of an ajitama). Gu Ramen also plays with heat levels, allowing diners—whether they order tonkotsu or shoyu broth—to amp up the fire in and around their mouth. Their spicy and super-spicy levels of three and four will leave your lips tingling thanks to a mixture of chili oil and ground, dried Thai chilis drizzled into your bowl, creating red rivets between broth and noodle. While the OG Laguna location is well worth scouting out, the fortunate aspect of the locale in DTLB is that the menu has been directly transferred, with over 20 Asian-inspired tapas (though it does not have 30+ taps like the Laguna and Santa Ana locations). Ramen Hub, in the Bixby Knolls neighborhood of Long Beach, and their Hakata ramen. Photo by Brian Addison. However, they offer relatively decent bowls of Hakata ramen and vegan Sapporo ramen—but each lack the depth of both HiroNori and Gu Ramen. Take their take on Hakata: their chashu, while quickly torched with a flamer right before serving, misses the levels and layers of flavor that both HiroNori and Gu achieve. And the tonkotsu broth is almost too heavy, leaving a thick film of fat in the mouth that, while certainly decadent, it’s reminiscent of kotteri, an extract of the back fat of Kurobuta pork and typically added only when requested due to its richness. 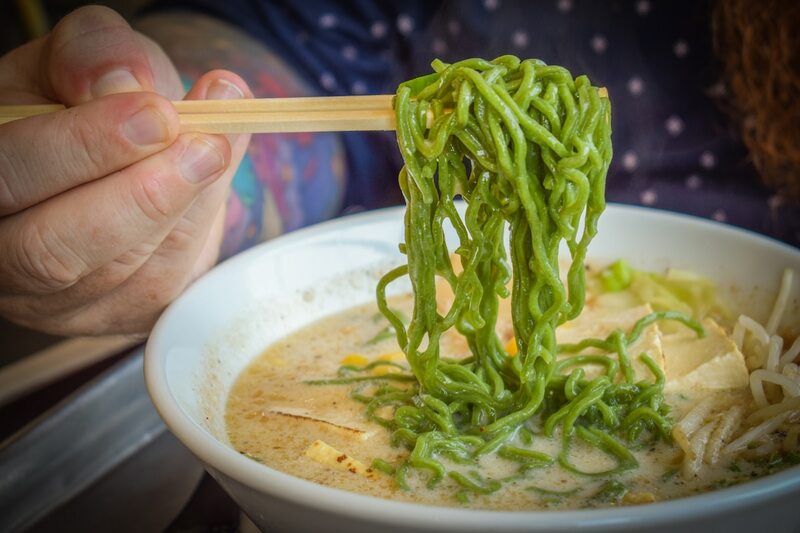 Their vegan ramen, served with an all-too-spinach-y noodle, has that same heavy feel, as if additional oil were added to bind to the miso-based broth. A bowl of ramen from Tajima Ramen, at SteelCraft in Long Beach’s Bixby Knolls neighborhood. Photo by Brian Addison. 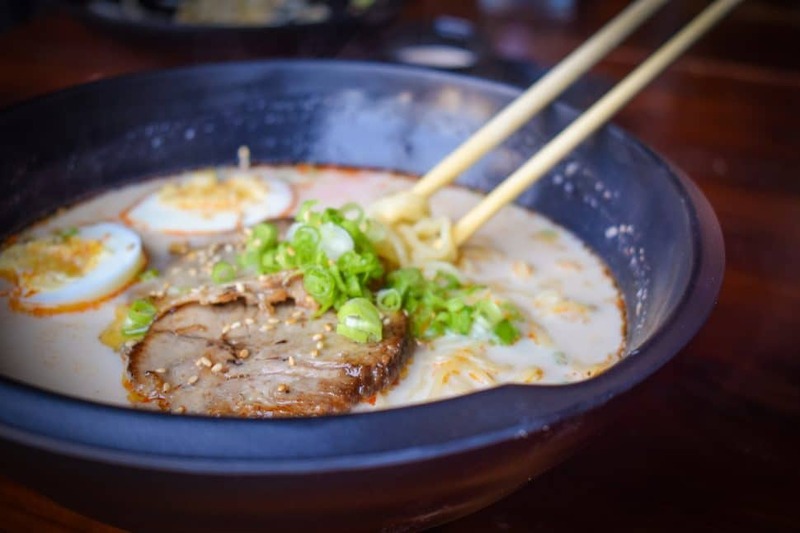 Last and, in the case of this list, least, sits Tajima Ramen, Long Beach’s first ramen house. 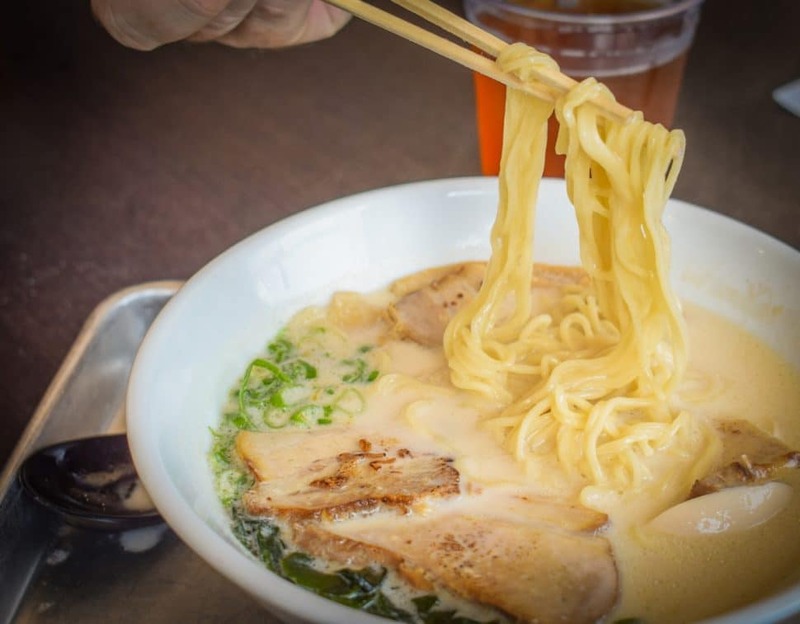 Tajima suffers from a few things: mainly the fact that it strives to create the complexity and magic of great noodles meeting a layers-of-flavor broth, but lacks both great noodles and great broth. To this, they add unneeded accoutrements—sesame seeds, garlic chips—but hold back too much on others—broth, for one—and it creates a mediocre bowl at best.